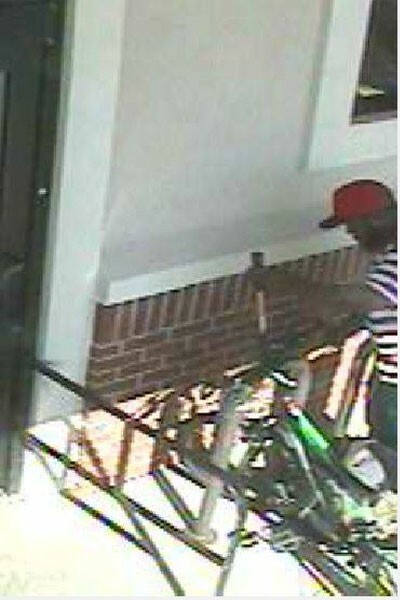 Surveillance photos show the suspect standing near a bike rack outside the store. Cherry Hill Police are asking for the public’s assistance in identifying a suspect who was recently involved in an incident at Wegmans. In surveillance photos provided by the Cherry Hill Police Department, the suspect is seen outside the store near a green bicycle. The suspect is wearing a red hat and a black and white striped shirt. No additional details on the investigation or the incident have been released. Anyone with information on the suspect is asked to contact Det. K. Grimaldi of the Cherry Hill Police Department (856) 432–8832 or kgrimaldi@cherryhillpolice.com. Information can also be provided anonymously at tips@cherryhillpolice.com.